Since 2009 we’ve run the SVA Premier programme to help VAs who want to fast forward their business by getting access to commercially sensitive or insider information. Initially we developed this as online webcasts and password protected blogs, but five years on, we’d covered most subjects and it made sense to devise a slightly more coherent way of organising the information… Our course was born! The course will give you exclusive access to marketing material, a guide through our existing blog (we know there’s a ton of information on there now! ), and access to asking Caroline Wylie (founder of SVA) private questions specific to your VA business. The topics covered were initially for people wanting to expand their businesses, but we’ve also included some start up topics too – making it suitable for newbies and established VAs alike. Ask Caroline questions specific to your VA business via email – get a personalised response and complete privacy. Hi, Do you have a logo for the SVA Premier or is it just the free logo I would use. We have the standard logo or the approved logo… There’s no real “graduate” logo for the Premier course as we don’t have any assessments. Roughly how many hours would you think it would take to complete this course? 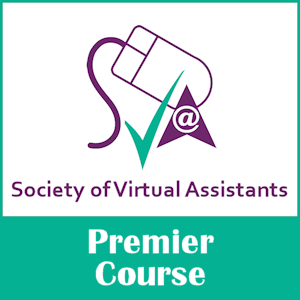 Would you say a VA course is essential to any newbie, even with years of experience in Personal Assistant roles and Business Support roles. I’ll be brutally honest, because that’s how I roll: Most VAs are self-taught, with 73% of them having no VA training. We designed the SVA Premier course because people were always asking us to pull together all the information into bitesize chunks for newbies, and we work it on 12 x sections… But there’s no real timeline for them, as you work at your own pace. It depends massively on how much time you have to put into developing the business. I always suggest you have at least 20 hours a week to work on the business, and some of those hours have to be within office hours. Running a business is most definitely different to being a PA, and that’s what we tend to focus on as it’s the part that most VAs struggle with. Can you tell if this course contains information on the “nuts & bolts” of running a remote business? So software advice, mechanisms of working remotely etc. Very much so – we don’t necessarily recommend software as this changes so rapidly, but we do recommend what you need to consider and also point you in the direction of equipment lists, business formats etc as well as going through some of the more practical stuff on bookkeeping records, planning marketing etc.